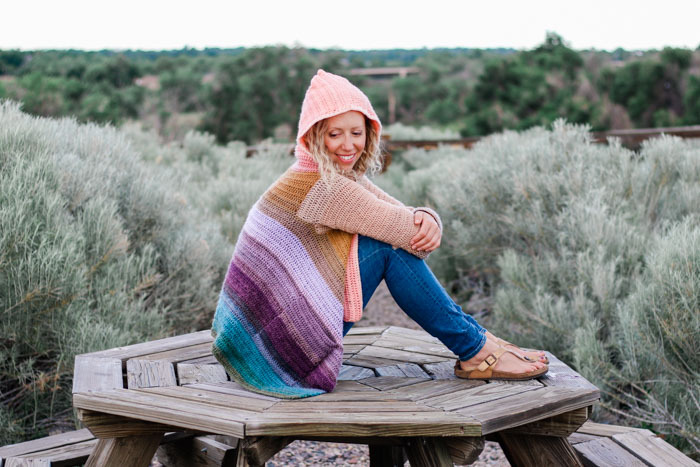 Learn how to remix Mandala yarn cakes to create a stunning gradient effect in this free draped crochet cardigan pattern. Get Part 1 of the free pattern below, or purchase the complete pattern in the ad-free, printable PDF with schematic and color planning worksheet for $2.99 here. Part 2 available here. 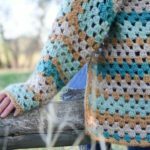 Oh boy, I’m excited to share this draped crochet cardigan pattern with you! (You can always find all my free crochet cardigan patterns here.) The entire process of dreaming up this pattern, remixing the yarn cakes and planning the gradient evoked such a feeling of creating just for the thrill of being a maker. 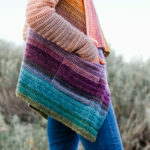 I truly hope this free pattern and tutorial inspires the same in you! 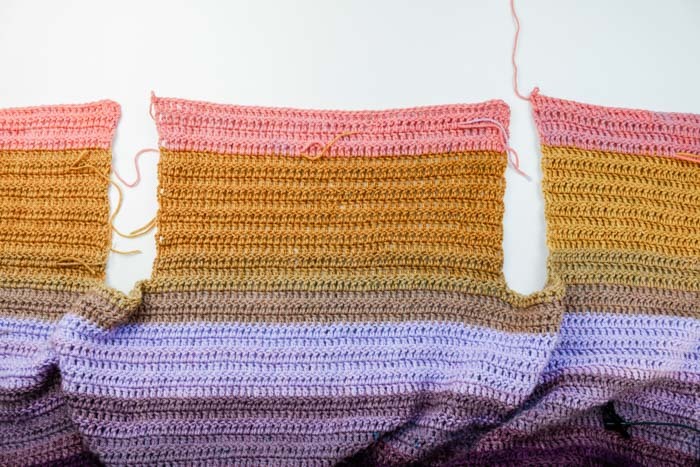 And let’s just settle two questions I know you’re already thinking: NO, there are barely any ends to weave in when you’re done and YES, you can totally make this pattern without deconstructing your Mandala skeins–the stripes will just look different. Why Remix a Yarn Cake? 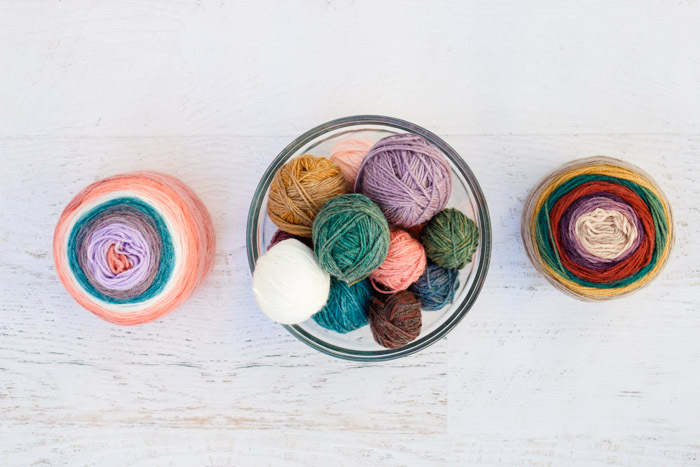 The whole concept of self-striping yarn is to simplify the process of color combining, so it may take a minute to wrap your head around the idea of cutting these gorgeous cakes up. 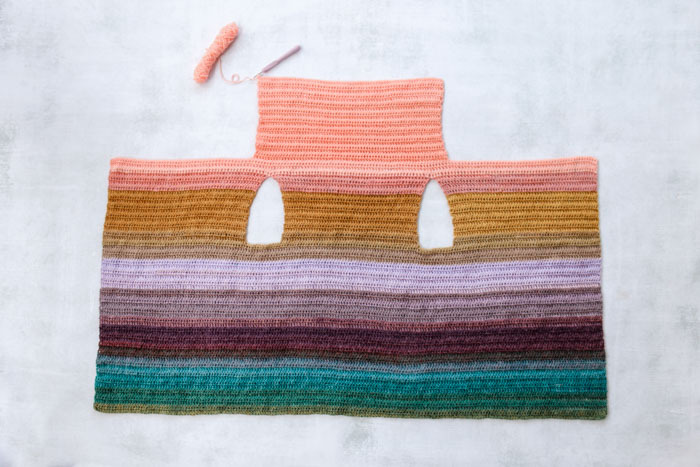 The beauty of deconstructing yarn cakes though is that it allows you to curate the exact gradient you want your sweater to have, including some really beautiful and nuanced color transitions that to me feel a lot like hand-dyed yarn. UPDATE: I put together a step-by-step video tutorial that covers how to choose your colors, deconstruct your yarn cakes and plan your gradient. Check it out here. One of the reasons I love our crochet community so much is that it feels like swimming in a giant sea of inspiration. Recently, Ashley of MontanaCrochet.com tagged me on Instagram because she was using this deconstruction technique to make the Day Date Cardigan pattern. She had been inspired by Kristina of MiramarWoods hand carved crochet hooks who was remixing yarn cakes to make sweaters. Seeing both these crocheter’s creativity was like jet fuel for my imagination. 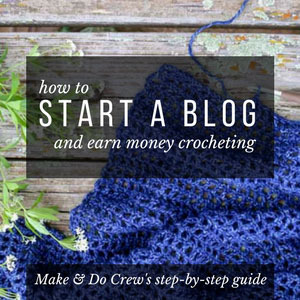 (Check out Montana Crochet here on Instagram and MiramarWoods here–they are both such an inspiration!) I put my kids to bed as fast as humanly possible, kissed my husband and ran out to buy some yarn! 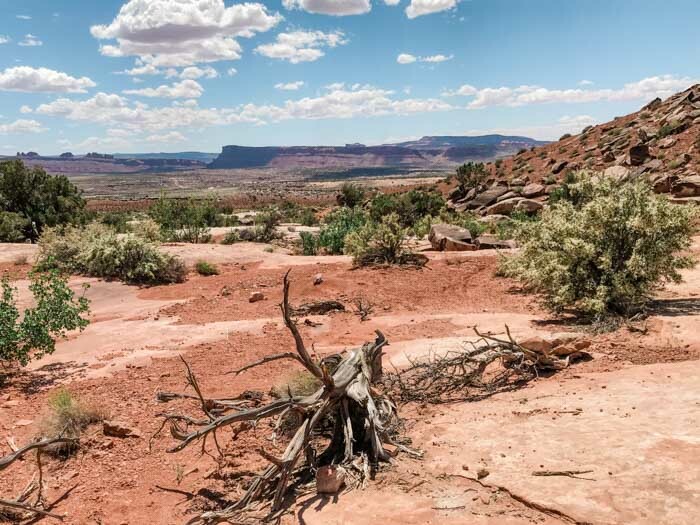 A few days later, my family and I took a mountain biking trip to Moab, Utah and I knew the color palette for my own deconstructed Mandala experiment had been born. For this pattern, I used one of my favorite cake yarns, which is Lion Brand Mandala in the colors Pegasus and Warlock. 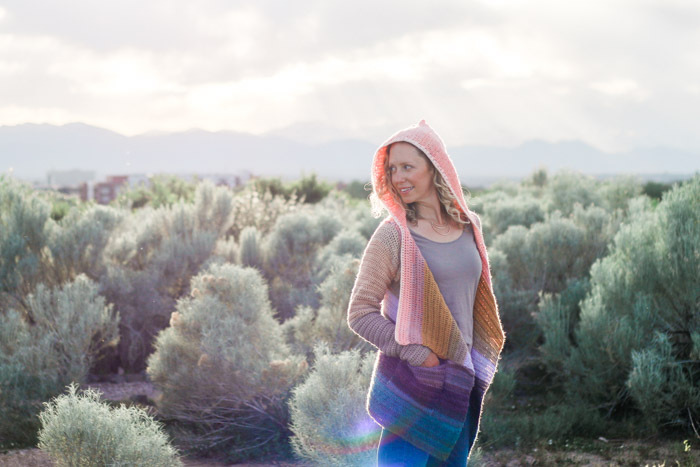 Mandala is machine washable, soft and just the right weight to create a flowy cardigan that drapes beautifully. 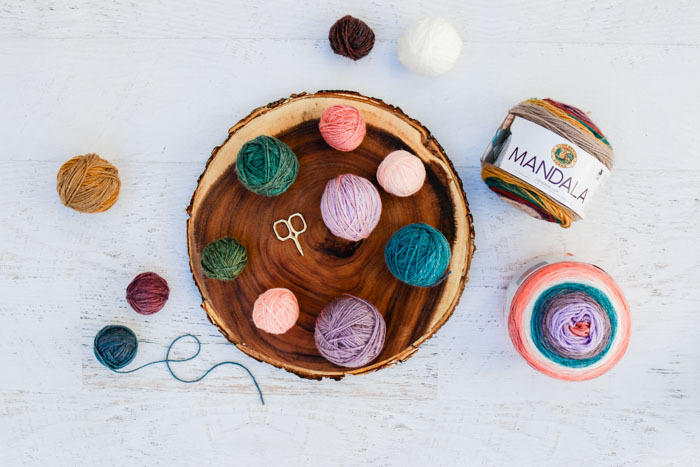 Perhaps the most exciting thing though–Lion Brand is now making a few other cake yarns called Mandala Baby, Mandala Sparkle and Cupcake that all have identical weight and fiber content so you can mix and match and shades from within any of these three product lines to “paint” your gradient. Seriously, how fun is that? There are SO MANY color options. Click on the following links to see what colors strike your inner artist’s fancy: Original Mandala, Mandala Baby, Mandala Sparkle, Cupcake. Okay, So How Do I Remix Mandala Yarn To Make My Own Cardigan? 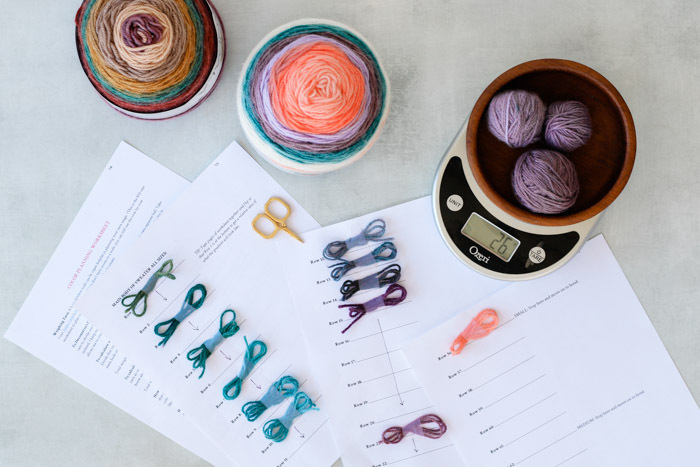 And maybe most helpful, the PDF includes a chart that shows how much yarn you’ll need for each section of the pattern, so you can really allocate your colors exactly as you wish. You can purchase the ad-free, printable PDF with color planning worksheet and chart for $2.99 here. This Draped Crochet Cardigan Pattern is Easy! Alright, let’s talk about the pattern for a sec, shall we? This flowy, draped crochet cardigan is a piece of cake (cake yarn, that is!) Truly, it is made from a big rectangle, with some creative construction sneekery to avoid any increasing or decreasing for the armholes. The only stitch you’ll need to know is double crochet. With very little seaming, this pattern is quite appropriate for a confident beginner. 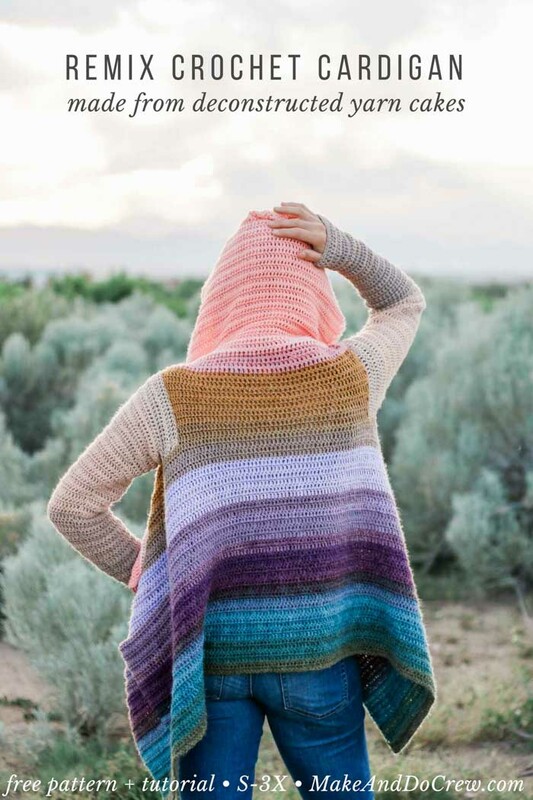 And if you’re intimidated by the whole deconstructing yarn thing, just opt to crochet with Mandala straight as it comes and you’ll end up with a beautiful cardigan with repeating stripes. Would you like to know more about deconstructing yarn cakes? 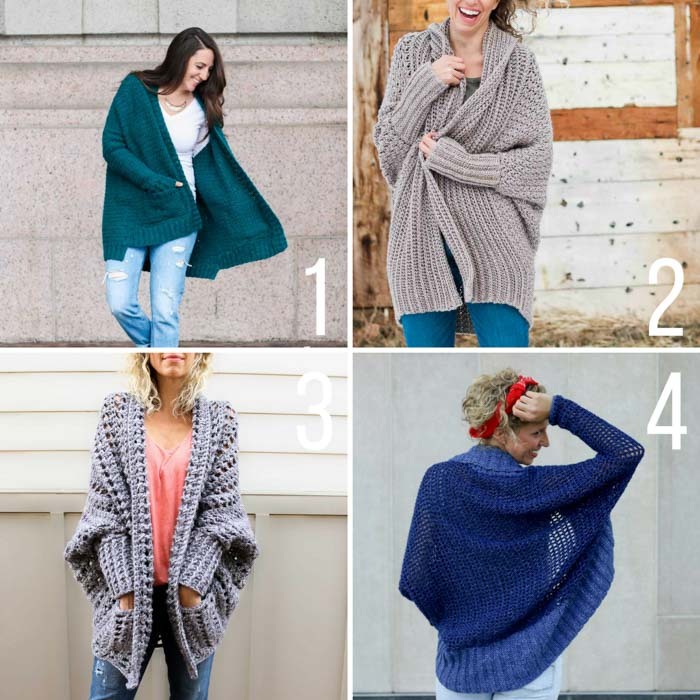 Or how to make this cardigan step-by-step? I’ve been thinking of putting together some video tutorials, so let me know in the comments if that’s something you’d like to see. You can find Part 2 of the free pattern here or purchase the ad-free, printable PDF with the complete pattern and color planning worksheet right now here! Watch the detailed video tutorial on planning your gradient here. • For more details on planning your gradient, watch this video tutorial. • If remixing colors, work 3 rows in the first color you’d like to appear at the bottom of the sweater. Then use a kitchen scale to weigh the 3-row piece in grams. Divide the total weight by 3. This number is how much each of the rows of your main sweater body will “weigh” (and therefore how much yarn they will consume). This is very helpful in planning how many rows to work of each color. See tutorial at end of printable PDF for more step-by-step details on how to calculate and plan gradient. • Because of the long length of the foundation, using the foundation double crochet stitch is recommended. Only work one foundation from the options below. Move on to sweater body. Foundation Row: Ch 192 (207, 222, 237, 252, 267). Rows 3-38 (42, 46, 46, 52, 52): Rep Row 2. • When placing markers, ch 3 at beginning of row counts as a dc. • If working a gradient, you may choose to work each section of a given color in each of the three columns before moving onto the next color. This will ensure that you have enough yarn of any given color to complete all three columns identically and prevent needing to frog something because you ran out of a color on the third column. Divide stitches as follows by placing a marker between stitches at appropriate points to mark Front, Armhole, Back, Armhole, and Front. Cut yarn leaving an 8” tail and pull through last st to fasten off. Continue working in same direction as first row of Front #1. Sk the 12 (14, 15, 17, 21, 28) sts between armhole markers. 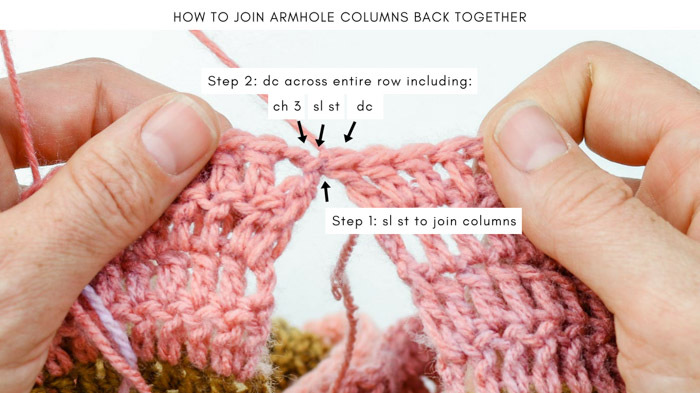 Join yarn in first st of back. Continue working in same direction as first row of Front #1 and Back. Sk the 12 (14, 15, 17, 21, 28) sts between second armhole markers. Join yarn in first st of second front. Use tail from Back to sl st to side of ch-3 of last row of Front #2. The Front, Back and Front should now be joined again. Continue with working yarn from Front #2. Main sweater body should now have a total of 56 (62, 68, 68, 76, 76) rows. • To eliminate hood, skip this section and work one extra collar row instead. Then also eliminate the finishing border. Divide stitches as follows by placing a marker between stitches at appropriate points. With WS of last collar row facing you, join yarn in first stitch of middle section between markers. Fasten off leaving 24” tail for seaming. You’re so close to finishing up this simple, flowy cardigan! Now, head to Part 2 where we’ll crochet the sleeves, seam the hood and add pockets. If you like all your crochet info in one easily printable place, purchase the complete ad-free PDF for $2.99 here. This is beautiful!! I love it! Next on my list to make! A video would be super helpful as well…thank you so much for putting out awesome patterns like this! I just finished my Day Date Cardigan and I love LOVE it! Yay! I’m so happy to hear you like your Day Date Cardigan. It’s one of my faves to wear. Thanks for your feedback on a video for this one too. I hope I can make that happen! Video tutorial will be much appreciated. This is a beautiful pattern I would love to make, definitely on my wishlist. Thank you so much. Just to let you know, I joined the ALchemy cardigan CAL and almost finished making it. I know! I’ll be sharing a tutorial with more info on choosing yarn this week, but essentially, I looked for two colorways that had similar types of colors, but in different tones and levels of saturation. I hope that’s helpful. I’ll have more details soon! I love Cupcake too! It’s totally swapable in this pattern as it has the same weight and fiber content as Mandala. Isn’t that cool? I bet a bag it it is lovely! Is the Remix Jacket made with one strand of mandala or is it two? Do I still need the same number of cakes if I’m not separating the colors, just using it straight from the cake? There is not a straight-on front view of the Remix Cardigan. Just wondering if there is some way included to close the front. I have a few ideas floating around but wanted to check with you first. I absolutely LOVE this cardigan for several reasons. First is your choice of colors, from my all-time favorite location for the colors. The reds with all the gradients right on into the purples; the gradients of all the greens in the foliage/flora; and of course the basic tans and browns of the ground leading into the red stones and mountains. I have gone by train through the southern desert and have hundreds of photos to prove it. Anyway, I’m going to buy the pattern right now to make during cool Michigan mornings. Thanks for all your creativity and hard work! 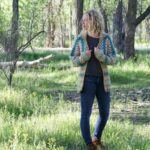 I enjoyed making the Habitat Cardigan so much I made four of them! One for myself and three for relatives. 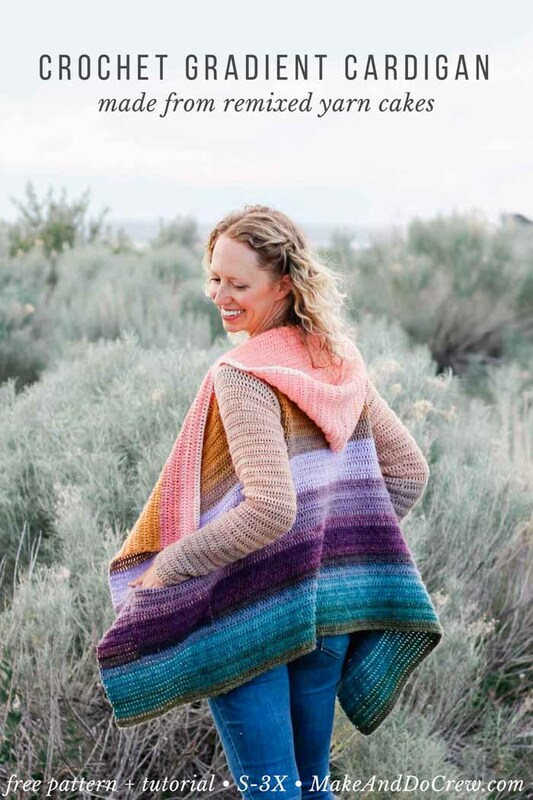 This Awesome Gradient Cardigan looks like it will be another Favorite for me. Looking forward to trying it…as soon as I finish at least one of the afghans I’m working on. 😉 Thank you for being you. Wow, you’ve been busy! What lucky relatives. 🙂 Thank you for the sweet words! Great to hear, Carie! Thank you so much! I did a bunting from a mandala cake that I hated, and deconstructed the other cakes i had into a granny square baby blanket. I love the freedom of mixing the deconstucted cakes. Hi Jess, I am getting behind on my crocheting because of the heat for a few days now and I don’t have air. Anyway I was reading over this pattern and it confuses me on the foundation rows, Why so many versions, is it by sizes or colors. It doesn’t say which to use for which size. How do I know.. I mean option 1 has one foundation row, option 2 has two different foundation rows. and then you have a actual row 2. ???? Hello. I have a question. Under the supplies section you have indicated that additional yarn is needed to achieve the look of the cardigan. You refer us to “Notes”. I cannot find any reference to the additional yarn requirement. Would you please tell me how much more yarn is needed? Do I need to purchase an extra cake of both colors? This is a beautiful cardigan and I am excited to make it. I am purchasing the paid pdf pattern as I think your chart will be very helpful.